Callum Elder. Photo: Joe Dent/theposh.com. 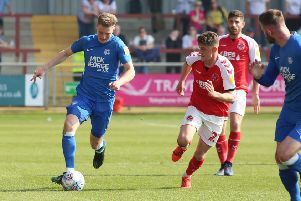 Peterborough United manager Grant McCann admits the loan capture of Leicester city left-back Callum Elder is in the balance. Elder was a massive hit at the ABAX Stadium last season until injury forced him to return to the Premier League side just before Christmas. Matty Stevens training in Portugal under the watchful eye of manager Grant McCann. It’s an open secret the 21-year-old remains a top target for McCann, but the new boss insists he has other targets up his sleeve. McCann said: “Everyone knows Callum is my first choice, but the situation has become quite tricky. Leicester want Callum to sign a new contract and if he does they will let him out on loan, but he hasn’t agreed terms with them yet. “I am in touch with Callum and he assures me if he is sent out on loan he will come to us, but nothing is sorted yet. “Leicester may well want Callum to play for them in pre-season friendlies. I believe they are trying to sell a left-back to Liverpool. If I get something in writing soon from Callum or his agent confirming he will come to us then I will wait for him, but if not I will move on and look elsewhere. McCann praises his first-team squad for their work in a pre-season training camp in Portugal last week. He was delighted to make three quality signings in midfielders Gwion Edwards and Brad Inman, plus teenage striker Mathew Stevens and thrilled to tie star man Chris Forrester down on an extended three-year contract. McCann has also appointed Forrester as first-team captain. McCann added: “The captaincy at the club was a bit of a joke last season. The armband was being handed around from player to player willy-nilly. I am delighted Chris accepted the captaincy and thrilled he has extended his stay at the club. “He was a top player for us last season, but finished the season exhausted, I expect a big season from him and I believe he will thrive with the captaincy. He’s a level-headed lad well respected by the rest of thesquad. “The new signings looked good while we were away. We have serious competition for places in midfield now and I like Matty Stevens a lot. “He’s only young, but I believe if you’re good enough you are old enough. “Matty played against us twice in age group football last season for Barnet and scored two hat-tricks. In a development game he gave Kgosi Ntlhe and Ricardo Santos a hard time. Posh open their pre-season ffriendly campaign with a trip to Boston United next Saturday (July 9, 3pm). The League One season starts at Rochdale on Saturday, August 6. Posh are then at home to AFC Wimbledon in the first round of the English Football League Cup on Tuesday, August 9. Saturday, July 16 v Norwich City (home). Tuesday, July 19 v West Ham XI (home). Saturday, July 23 v Leeds United (home). Tuesday, July 26 v Brentford (away). Tuesday, July 26 v Lincoln (away). Saturday, July 30 v Barnsley (home).